Last week, our pastor asked the congregation to pray. He shares with all who were there listening, "Pray for your pastor." This is something that has been requested over and over again by many servants of God. The most wonderful gift any pastor can give to the Church is constant prayer for the sheep. Likewise, the best response is for sheep to pray. The shepherd prays for the sheep. Let the sheep also pray for the shepherd. We need praying shepherds as well as praying sheep. We need leaders who pray. We need members to pray. Blessed is the Church whose leaders and members regularly pray for each other. A Church that does not pray becomes easy prey for the evil one. A Church with praying leaders and praying members form a tight defense against any spiritual attacks. I am starting a series which I call the "Anti-Busyness Campaign." I have not decided how many articles as yet. This will be the first which talks about work. Here I am again, talking about one of my favourite things to bash. It is the face of busyness. Signs can be intriguing. 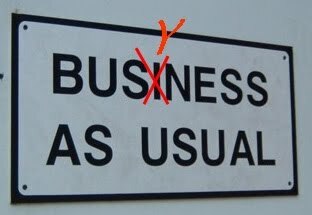 Sometimes, while construction is going on within part of a shop, the owners will put a prominent sign to tell customers that they are still in business. In other words, despite the ongoing construction, business will be as usual. I want to contend that no matter how we look at the word 'busyness,' it is not the normal state for the human being. In other words, man is not created to be busy 7 days a week. We live a busy lifestyle. One major factor is survival related. We have bills to be paid. Without a job, one can ill-afford the monthly mortgage for the house, the preferred car or the dream vacation to an exotic destination. We push ourselves to meet the quarterly targets, and to reap our financial rewards. We push ourselves to meet deadlines, and to accomplish an important milestone for a significant business project. We push ourselves to get things done, to stay ahead of the competition that threatens to eat our lunch. We become pushy people. We push the authorities. We push for our voices to be heard. We push others. We push ourselves. Busyness is a continued state of pushing without pausing.